Last year the Trouvere Medieval Minstrels performed at Swaledale Festival in the historic Gayle Mill at Hawes. It is always a great pleasure when a Festival appearance has a spin-off such as a new partnership of artists, or as in this case, the realisation that there is a place for a whole new event. 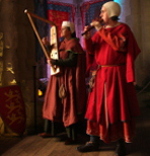 The first Medieval Music in the Dales takes place in Bolton Castle, Wensleydale from 2nd- 4th September 2016 and features medieval music, instrument makers, workshops and market. Swaledale Festival has a new major sponsor. Brymor Ice Cream will sponsor the Reeth Lecture given by Andrew Graham-Dixon on 30 May They will also sell ice-creams at concerts held in Grinton church, a new venture for the Festival. Brymor Ice Cream has agreed a sponsorship deal with Swaledale Festival that will see the as sponsors of the Reeth Lecture and bring ice-cream sales to concerts in Grinton church. The Europe for Festivals, Festivals for Europe label was officially launched in Paris and its first award ceremony held.